Below you will learn the basic information you need to know if you are buying diamonds. The information here is just the bare bone basics that any shopper should know before heading out to the boutiques. Bija Bijoux is not your average diamond ring store, but we do offer custom design and have access to any diamond you may wish to purchase. In store however, our diamonds are tiny, sparkly and stylishly set into funky jewellery designs by Canadian and U.S. jewellery designers. We are of the less flashy set but would like to help you find exactly what you want as well as ensure that you know exactly what you should be getting, even if not from us. Price comparison of diamonds is only possible if you are comparing apples to apples. The 4C’s provide a way to objectively compare and evaluate diamonds: Carat, Colour, Clarity and Cut. Diamonds and other gemstones are weighed in metric carats: one carat is equal to 0.2 grams. The diagram below will give you a visual on carat size. Just as a dollar is divided into 100 pennies, a carat is divided into 100 points. For example, a 50-point diamond weighs 0.50 carats. But two diamonds of equal weight can have very different values depending on the other three members of the Four C’s: clarity, colour and cut. The majority of diamonds used in fine jewellery weigh one carat or less. Most diamonds found in jewelry stores run from colourless to near-colourless, with slight hints of yellow or brown. The Gemological Institute of America, known to professionals in the jewellery industry as GIA, has a standardized colour grading system. GIA’s color-grading scale for diamonds is the industry standard. The scale begins with the letter D, representing colourless, and continues with increasing presence of colour to the letter Z, or light yellowish brown. Each letter grade has a clearly defined range of colour appearance. Diamonds are colour-graded by comparing them to stones of known color under controlled lighting and precise viewing conditions. Many of these colour distinctions are so subtle as to be invisible to the untrained eye but these slight differences make a very big difference in diamond quality and price. Before GIA developed the D-Z Color Grading Scale, a variety of other systems were loosely applied. These included letters of the alphabet (A, B and C, with multiple A’s for the best stones), Arabic (0, 1, 2, 3) and Roman (I, II, III) numerals, and descriptions such as “gem blue” or “blue white”. The result of all these varied grading systems was inconsistency and inaccuracy. Because the creators of the GIA Color Scale wanted to start fresh, without any association with earlier systems, they chose to start with the letter D—a letter grade normally not associated with top quality :). Because diamonds are naturally formed deep within the earth, under extreme heat and pressure, they often contain unique identifying marks, either internal (inclusions) or external (blemishes). Diamond clarity refers to the absence of these inclusions and blemishes. Diamonds without any “birthmarks” are rare, and rarity affects a diamond’s value. Using the GIA International Diamond Grading System™, diamonds are assigned a clarity grade that ranges from flawless (FL) to diamonds with obvious inclusions (I3). Each diamond is unique. None is absolutely perfect under 10× magnification, though some come quite close. Known as Flawless diamonds, these are exceptionally rare. The GIA Clarity Scale contains 11 grades, with most diamonds falling into the VS (Very Slightly included) or SI (Slightly Included) categories. In determining a clarity grade, the GIA system considers the size, nature, position, colour or relief, and quantity of clarity characteristics visible under 10× magnification. Like the color scale, GIA’s clarity grading system developed because jewelers were using terms that were easily misinterpreted. Today, even if you buy a diamond in another part of the world, the jeweler will likely use terms such as VVS1 or SI2, even if his or her language is French or Japanese instead of English. Cut is the factor that fuels a diamond’s fire, sparkle and brilliance. The cut can make or break the beauty of a diamond. The traditional 58 facets in a round brilliant diamond, each precisely cut and defined, are as small as two millimeters in diameter. Without this precision in the faceting, or cutting, a diamond would not be as sparkly and beautiful as it is. An understanding of diamond cut begins with the shape of a diamond. The standard round brilliant is the shape used in most diamond jewelry. All others are known as fancy shapes. Traditional fancy shapes include the marquise (points at each end), pear, oval and emerald cuts. 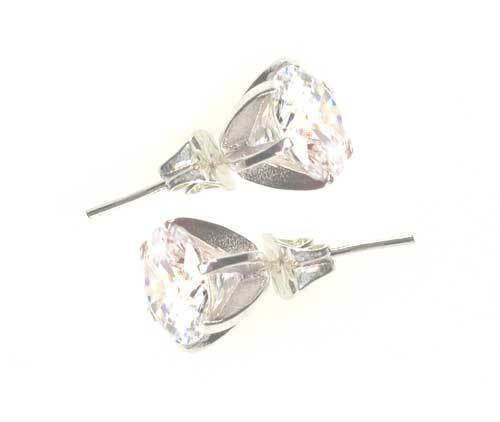 Gaining in popularity over the years are the other fancy shapes, such as hearts, cushions, triangles and princess cuts. As a value factor, however, cut refers to a diamond’s proportions, symmetry and polish. For example, look at a side view of the standard round brilliant. The major components, from top to bottom, are the crown, girdle and the pavilion. A round brilliant cut diamond has 57 or 58 facets, the 58th being a tiny flat facet at the bottom of the pavilion that’s known as the culet. The large, flat facet on the top is the table. The proportions of a diamond refer to the relationships between table size, crown angle and pavilion depth. A wide range of proportion combinations are possible, and these ultimately affect the stone’s interaction with light.